Leave it to Beyonce and Jay Z to shut it down for Halloween. On Monday night, the couple transformed into real-life Barbie and Ken. Bey, who was boxed in classic Barbie pink, wore a black-and-white striped bodysuit and mirror shades with a sky-high ponytail and bold red lips. Jay Z, featured in the Black Collector Edition, channeled “40th Anniversary Ken” in a dapper tux that came complete with a silver bow tie and cummerbund. The rapper even had hair that was perfectly coiffed. 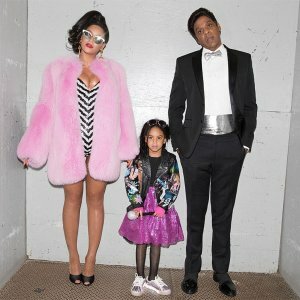 Though box free, daughter Blue Ivy still got into the Halloween spirit with her parents. She paired a leather jacket that had “Barbie” written in the back with a shiny skirt, fishnet tights and silver sneakers. Just the day before, Bey and Blue, along with Tina Knowles, re-created Salt-N-Pepa’s “Push It” music video. Clearly they dominate when it comes to the best group costumes category.